The Class and Component Price announcement for January 2010 showed a a slight drop from the December 2009, prices. 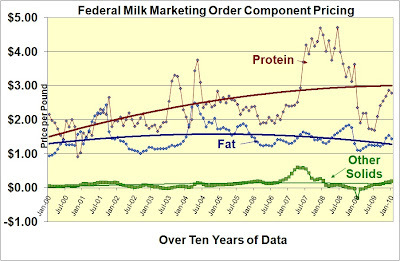 Protein prices dropped 2.9% from December 2009, falling from $2.88/lb to $2.79/lb. Likewise, butterfat dropped 6.7% from $1.54/lb to $1.44/lb. 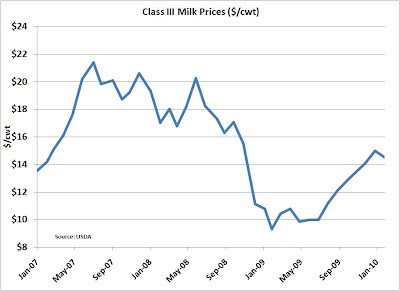 As a result, the Class III milk prices also showed a 3.3% dip from $14.98/cwt to $14.50/cwt. As discussed in previous blog posts, cheese prices are the most important factor in Class III pricing. 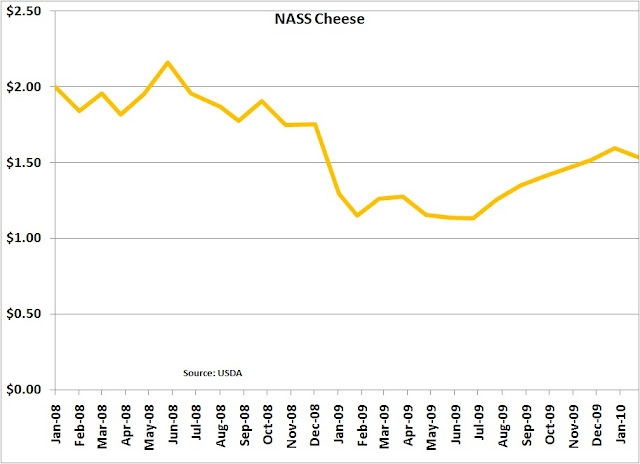 The NASS cheese price fell 3.7% from %1.60/lb to $1.53/lb in January. 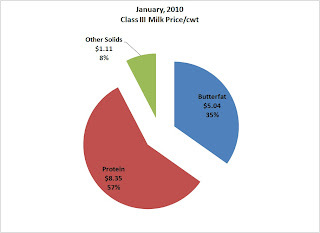 Based on the standard USDA formulas, protein payment made up 57% of the Class III price. Clearly, protein in milk is the very most important component for a producer to concentrate on. 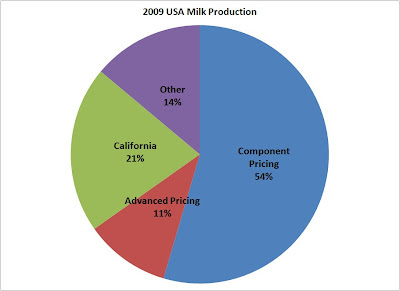 The statistic that influences milk pricing, eg. exchange rates for the USD and the New Zealand dollar have been going the wrong way. The dollar is stronger and the New Zealand dollar is weaker. Grain and oilseed prices have moderated which will help offset the loss of milk revenue. For now, 2010, appears to be a year of moderation on both the revenue and expense sides.